CVN cameras covered a full lineup of blockbuster verdicts won by many of the top plaintiff’s attorneys in Georgia this year. The recipient of our 2017 Georgia Plaintiff’s Attorney of the Year honor spearheaded a $45 million-plus verdict in a catastrophic brain injury, med mal case. The verdict: Jurors awarded $45.8 million for the catastrophic brain injury a woman suffered in a hospital, days after the birth of her child. The details: Shannon Trabue went more than 10 minutes without oxygen when she suffered a heart attack three days after the birth of her child. William Stone led a legal team claiming the heart attack was caused by unchecked hypertension and pulmonary edema, or fluid in the lungs, that was not properly treated by doctors from defendant Atlanta Women’s Specialists. Stone delivered a powerful opening demonstrating what he claimed was the unchecked fluid overload that set up Trabue's heart attack and followed it with expert testimony supporting the theory that an edema could have been prevented with common medication. In closings, he cemented his case by undercutting the defense claim that an undetectable pulmonary embolism caused her heart attack. “The caregivers at Northside [Hospital] were so doubtful that it could possibly be a pulmonary embolism that they didn’t even do a follow-up study from the CT scan that showed it wasn’t there,” Stone said. Jurors deliberated about 15 hours before handing down the $45.8 million verdict, the largest Georgia award CVN covered in 2017. Stone, who tried the case with his sons Ryals and James Stone, as well as Michael Regas, put on a master-class in the courtroom. 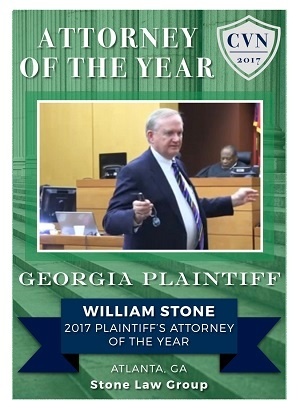 His blockbuster win earns him the honor as CVN Georgia’s Plaintiff’s Attorney of 2017. Watch Trabue v. Atlanta Women's Specialists.